Easedale Self-cateringEasedale is a delightful rural retreat set in several acres of wooded hillside grounds which are graced with the presence of many different varieties of birds, badgers, deer and red squirrels - one in particular who regularly visits the tree right outside the front door! There are some well-known walks from the door including Alcock Tarn, Loughrigg, Fairfield and the Rydal Round. Grasmere village is only a short walk down the hill, where you will find a wealth of shops, cafes, restaurants and pubs and the famous Gingerbread shop. 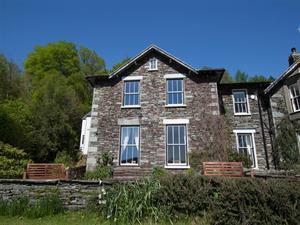 Dove Cottage and Grasmere lake are also only a short walk away. Easedale provides well-planned and comfortable accommodation with everything needed for an enjoyable stay in any season. Accommodation: Front door entrance into hallway with space for coats and boots. Door leading off to the sitting room/dining room/bedroom (TV/DVD/CD/Ipod docking station and free wi-fi), which has high ceilings, period cornicing and large sash windows with lovely views towards Grasmere lake and Silver Howe beyond. Further doors lead off the hallway to the shower room with corner shower, basin, wc, underfloor heating and also to the well equipped kitchen in a modern shaker style. The property has mostly fitted carpets throughout, infrared thermostatically controlled heating and double glazing. Furnishings are of a modern country house style having a comfortable feel with co-ordinated neutral colours and pretty fabrics. Outside: The front of the property has a paved sitting-out area with garden furniture (views towards Grasmere and beyond) and large shared gardens. There is private parking for one car in an allocated space. On site shared laundry with coin operated washer and dryer. Grasmere centre approx three quarters of a mile. Easedale offers weekly bookings starting on Saturday.